Forum Index > Makers and Manufacturers Talk > Tods Stuff is dead! Long live Tods Workshop!! Posted: Thu 18 Jan, 2018 3:04 am Post subject: Tods Stuff is dead! Long live Tods Workshop!! 20 years ago I started making all manner if historical pieces and when people asked what I made I said "stuff" and Tods Stuff was born. Well it is time for a change of................well, everything really. So here come 2 new sites, more and better pictures, a completely new structure, many new products and much better navigation. www.todcutler.com contains more standardised products that are made to my specifications and at fantastic prices for the quality. Please come and have a look and I hope you like the changes. Easy to navigate, great photos and I especially appreciate being able to get on the e-mail mailing list. Well, apart from my heart skipping a beat reading the title and imagining that you pulled the plug on making cool stuff and found a " Secure " Government job pushing paper. I will have to go take a detailed look at the new site later, but it seems like it's a good new site with more options for customization. A quick glance at the Todcutler offerings seem to offer very high quality stuff at affordable prices when one doesn't need or want to go for full custom work ...... The product range and quality seems to be improved. Great "stuff" as always, and appears to be a sustainable long-term model. Good for everybody! Looks great. I am loving all the high-resolution photos with multiple angles. Thanks guys and yes it is a massive improvement and hopefully will streamline everything a little and take some of the pressure off. Don't worry though Jean, I won't be hanging up my cutlers apron for a while yet at least until I can execute some form of alchemy that turns knives into Ferraris, endless holidays and a nice pension scheme (actually any pension scheme come to that). I don't know if you're looking for feedback or not, but looking at the website, and seeing your post... There was one comment I thought I might add which might be useful. I feel like the term 'bespoke' should really be used in here for a piece made individually, entirely, from scratch.. If you are going to use the term at all. A 'custom' piece would then fit for a piece which exists already, but has then been 'customised'. I think this would reduce confusion, as it would follow with how the terms are used in other industries. I'm currently working in menswear which is why I'm a bit pedantic on this. Bespoke means the material (originally obviously cloth) has 'been spoken for' it will be made into something new/unique. 'Custom' (or in suiting world often Made to Measure) rose out of people 'customising' an existing item, i.e. modifying an existing creation. I think it's a great idea, and all... I'd just, personally, swap the two terms.. as you are using the same two terms as in these other industries, but swapping them. The shoe industry, uses the same bespoke/custom usage as I describe above... and is also leatherworking, same with briefcase makers in London like Swaine Adney Brigg, etc..
Just thought about this when I saw it, and wanted o pass it along! Congratulations, Tod, on your new website ! I have been leisurely browsing for about an hour, and delighting in all the "eye candy," so pleasantly arrayed for all to see. Love the large close-ups, they really show off your work to best advantage. Also, in the crossbow section, linking it to YouTube allows one to see how it actually works in practice. As a non-native English speaker I would like to add something to that. To my understanding Tod has customers from all over the world, so there is somewhat of a language barrier. I would even go so far as to suggest that most of his international customers (except obviously the US, Canada and Australia) have probably never really encountered the word "bespoke" in the first place. I'm sure I'd heard it somewhere before, but then again, I've been studying English at university for years now. As an outside view from someone who had not been consciously aware of the word: judging from the sound and shape of the it alone, "bespoke" seems very much more sophisticated than "custom" or "customized". Therefore I would support Zach's notion that the categories "Bespoke" for fully custom pieces (from scratch) and "Customized" (participle form) for pieces with some alterations to a pattern might be more intuitive. Also I really want one of those basic rondel daggers from your cutlery shop. At that price, how can I possibly resist. Fantastic webpage Tod, I've really enjoyed looking through it for a bit now. Everything is very clean and pretty quick-loading. I have to say it's always been a highlight when I log in to myArmoury and you tell us all that there's new items posted on your website. Hopefully this won't change, it's nice to see your work whenever it's up and available, or when it's a fantastic custom job you've completed. One thing that could be a nice addition to the shop interface on the Tod Cutler page might be an indication of expected wait time. As I had alluded to I ordered one of the budget rondel daggers, but I have no clue whether it is "in stock" or if I will have to wait weeks or months. I agree with you, and if things are as they used to be most things on the Tod's Cutler page is usually stock with no wait time, sometimes it may be out of stock of course but won't have a very long wait time. I ordered a thing or two from the old Cutler page and it wasn't in stock and I had to wait a week for it to be made, I was contacted about this a day or two after my order without inquiring about it myself. Congratulations on the new Site. This format is a really attractive and very important improvement. Your work deserves the best visual representation that technology can give it. Of course, no web page is going to give someone the "wow" effect of actually holding a real piece of history in their hands. The crossbow you made for me is balanced, beautiful, POWERFUL and very accurate. That said; it is the FEEL of the bow and cranequin and how they both harmonize, and with very little effort store 650 lbs of draw weight, that almost defeats an attempt to describe. I saw such weapons in museums and wondered how on earth you'd ever get a deer with such a contraption. Now I know. I'm familiar with the term "Bespoke" in association with fine men's clothing. A business has a select palette of fabrics and designs. The goal of the business model is to choose and source desirable materials, design fashionable product models using the purchased fabrics and then fit them to a customers wishes. The end product is fitted perfectly and looks and feels/moves much better than an off the rack product does. I've always associated the term "Custom" with either the open offer of a craftsman to create items according to a customers vision (within a given scope), or a customer approaching a craftsman and having his commission accepted. The difference to "Bespoke" lies in the willingness of the supplier to source materials not usually in his/her catalog, and very possibly to research and apply new/unfamiliar techniques in the course of completing the commission. The result is a truly unique item, not one adapted from a template. Thanks very much for the positive feedback and thoughts. There have been a few drivers behind all the changes that have been building for a few years and getting better images and a more streamlined system for both the user and Lou and I has been a large part of it. Another aspect is how to divide my different work streams so it makes sense and that is where the custom/bespoke divide comes in. Dealing with the easy things first. Tods Workshop - Everything made by me. In stock - These are items I have made and are sitting on the shelf ready to go out. I will explain this as honestly as I can. There are a number of fairly standard products that I have made over the years that do not require much correspondence between the customer and myself to execute a lovely piece. For example a simple crossed and integrated scabbard for an Albion Senlac - belt length and colours pretty much cover it. However when this is put into emails and not all the information is supplied and then a couple of nicities about the current weather in Scotland and whether this should be worn over a gambeson and....and bam 10 emails is easily achieved. All of which either stop me actually making the piece or stop me being with my family. An 11pm finish on the emails is pretty normal for me. However this site is also about the customer too. My current record is over 120 emails about a single simple piece. When it comes to me making that piece a few months down the line from the start of the email chain, I have to wade through 120 emails trying to extract the specification util it has gelled to what I believe to be the correct result and then I make that - the chance of it being fully correct is in fact diminished because there is simply too much correspondence. The conclusion is that for fairly straightforward projects even of a 'semi custom' nature it is better for both myself and my customers to standardise as much as possible and remove the email chain. When the project actually requires that email interaction and the going back and forth then it falls into the 'custom' category on my site, so the time taken for the correspondence will be reflected in the price. For example the 120 email exchange was for a £600 product, so not for making the object itself, but for the correspondence alone it is £5 an email and somewhere out of that I have to actually make the project too - it was not working. In a condensed form, time is money and I have to make a living and emails were taking up around 2-3 unpaid hours a day. So back to the category name. In the sword and knife world, we have 'custom makers', we buy 'custom knives', we do not have 'bespoke makers'. 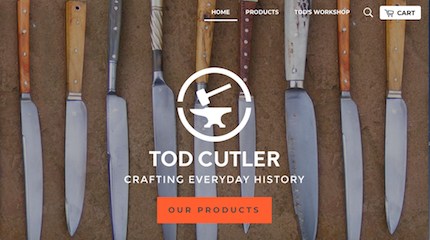 The power of Google is king and so I cannot be a 'bespoke knife maker'. So this means that the decision for my custom work was made and it cannot really be anything other than 'custom'. For my 'semi-custom' work which is labelled as 'bespoke' is where the debate came as to what to call it and it raged long and hard. 'Semi-custom' is the obvious answer, but is not as universally known as 'custom'; 'modified' could work but is clunky and so on. These pieces are not cheap and so the customer requires some faith that I will make a great piece and part of that is to feel they are special, not just 'semi-secial' (you are all special!) and so we needed a category title that is a little more special and little less 'industrial' than 'semi-custom'. So we settled on 'bespoke' and although it is not quite correct in its usage is pretty close, sounds special and most people will not know that its usage is incorrect, they will just know that it means 'customised' if they know at all. I hope that shows a little of the reasoning behind the new layout and the sector names, but please ask or comment as you wish and these are insights are very useful. 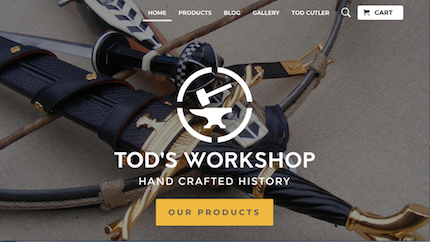 The response to the new site has been good so far and we plan to continue adding to the product lines rapidly in the next few months to www.todcutler.com and of course new pieces get added to my in stock page on www.todsworkshop.com fairly regularly. A good and fair writeup, Tod. It actually made me more conscious about how many emails I send back and forth, it is a fact I think it is easy for us as customers to simply forget, that while our mail may not take long to respond to on its own you have hundreds of them and time quickly adds up, it is healthy to be reminded of the time and effort communication like this can actually take and I will certainly be more mindful of it in the future. Hopefully this new website streamlines everything and you get some more time with your family. It has also made me aware that sometimes I forget that we are not having a " Forum " discussion when I am contacting you to discuss an order for custom work, or just for ordering something in stock, or of your regular production not needing any changes: it's too easy to fall into friend mode and forget that at your end it's a business and that I am not the only person sending you e-mails. Tod I do consider you a friend here on " myArmoury ", and it's a friendly business relationship when contacting you to order something, but it's important to respect the use of your time and keep the more conversational stuff for here on " myArmoury ". Ideally simple orders should be done with a minimum of back and forth e-mailing. For custom/bespoke commissions it might be useful that when the design has been agreed to that a summary of all key design choices be saved to one file making having to review 120 previous e-mail unnecessary ..... ? There are some good discussions here, but hey, call it what you want, I'll still buy what you make. Shelf, bespoke or custom. I know it makes me sound like a grumpy ogre, and it is obviously very important to keep personal relationships, especially when large sums of money and perhaps more importantly, trust, are involved, but it was becoming too much for too long. Jean (we go back as digital friends 10 years or so?) makes a very valid point about the 'job precis'. My new method is actually a fairly simple change. We will still have the email exchange as has to be required with the more complicated jobs, I will the write a job sheet with a description of the job and the details and that will then get signed off by the client. Of course we all change our minds sometimes, but when this does happen then a new sheet will be signed off and the old destroyed, so there will be no more wading through paperwork trying to filter out the specification. Clearly this simple change is no great revelation to most people, but it is fair to say that I am better at making things than being good at admin - anyway that is part of what is changing.